In Friday's post, I noted that continued drying of tropical forests raises the potential that the global carbon sink might weaken in the future. This is one of a variety of such possibilities that one sees news stories about every so often (for example here and here). 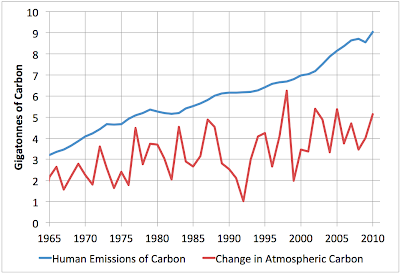 The background is that, as humanity has been emitting fossil fuel carbon dioxide over the last 150 years or so, not all of it stays in the atmosphere: the elevated concentrations in the air mean that the atmosphere and the ocean and land biosphere are out of equilibrium and some of the CO2 leaves the atmosphere and goes into the ocean and biosphere each year, partially offsetting our emissions. Once out of the atmosphere it no longer affects the climate (though it may have other effects such as ocean acidification and causing ecological changes). It's pretty easy to assess this oneself with no more than a basic memory of high school chemistry, the Mauna Loa CO2 data, and the BP data on carbon dioxide emissions. From the Mauna Loa data we know how the concentration of CO2 in the air changes each year and we want to convert that into a number of gigatonnes of extra carbon floating above us. To do that we need two things: to know the total mass of the atmosphere - 5.1480 x 106 GT according to the Wiki - and a way to convert the volume mixing ratio of CO2 into a fraction of that total weight that is carbon (for consistency I will just work in carbon terms - to get carbon dioxide masses just multiply by 44/12). To do this we can use the fact that the carbon atom in a CO2 molecule has an atomic mass of 12, while nitrogen (N2 - molecular weight 28) is 78.084% of the atmosphere by volume, oxygen (O2 - molecular weight 32) is 20.946% by volume and Argon (atomic weight 40) is 0.9340%. We can safely ignore the remaining trace components. So we want to multiply the change in CO2 volume concentration by 5.1480 x 106 *12/(0.78084x28 + 0.20946x32 + 0.00934*40) to get a change in the mass of carbon in the atmosphere (the denominator is basically the molecular weight of the average molecule in the atmosphere and the numerator has the atomic weight of carbon - 12 - and this is how we convert from volume terms to weights). 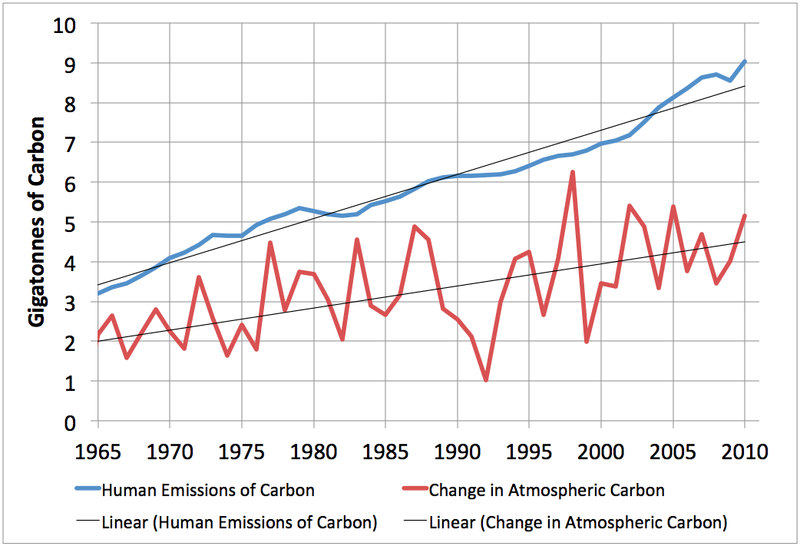 Here we see that the fraction of emissions that get reabsorbed by the planet each year seems to be increasing not decreasing. However, unlike some scientists I could name - I will disclose that this uptrend is not statistically significant - simple linear regression gives a trend of 2.1%/decade ± 1.9%/decade, and the result (with p=0.237) is entirely consistent with being really flat and the apparent uptrend just a fluke of the noise. But at any rate, there is certainly no evidence of the sink getting weaker. So while we might worry about increasing drought causing runaway feedbacks in the climate in the future, there is no evidence of a weakening global carbon sink at present. 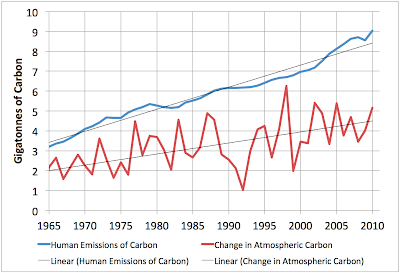 A regression on that red line gives an increase of 0.56 GT/decade and the p-level is miniscule (t statistic of 6) - as I mentioned the other day the concentration of CO2 in the atmosphere is increasing quadratically (because our rate of emissions is increasing at a roughly linear rate). Sorry, I feel compelled to quibble over the use of the word "degrading" in the title of this post. Though it may be true that the global "carbon sink" is still operating in a fairly normal way, the physical qualities of those sinks may in fact be degrading. For example you mentioned ocean acidification - as much CO2 as ever before may be going into the oceans but, clearly, the quality of this "sink" is degrading as it acidifies. I take your point Lucas - I was not attempting to imply anything more than that the sink qua sink was not becoming less effective. 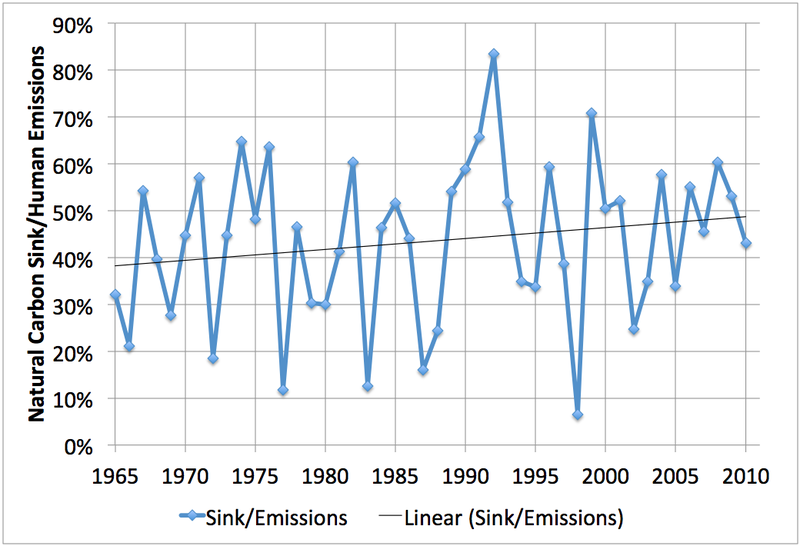 It's clear the fraction of yearly emissions that goes into the sink is not increasing. 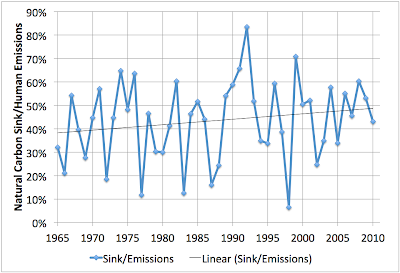 But, because yearly emissions are increasing, the size of the yearly sink has grown - from about 1.5 gigatons in 1965 to over 3 gigatons today. This is remarkable and likely reflects in part increased growth of plants due to higher levels of CO2, which is food for plants. Of course the sink is not quite keeping with increased dumping of CO2 into the air by humans and is as you note vulnerable. source of substantial concern. While there remains discussion about whether this trend in the AF is actually statistically signiﬁcant (Knorr, 2009), we focus our discussion here on whether the inferred conclusion is possible, i.e. 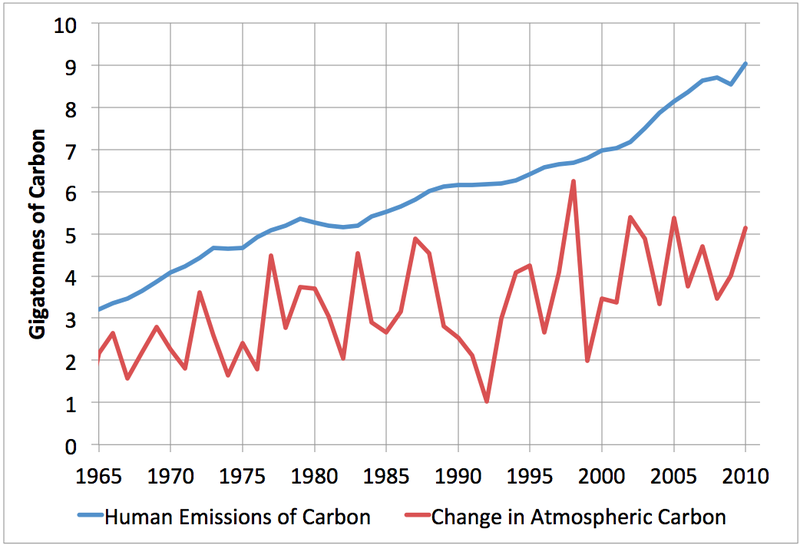 whether an increasing trend in the AF implies a decreasing e ﬃ ciency of the carbon sinks. and I think their conclusion is similar to yours - s S/N ratio is to high to conclude anything robust. "and likely reflects in part increased growth of plants due to higher levels of CO2"
Actually a few studies in 2011 find no evidence of the CO2 fertilization effect. Much of the drawdown in CO2 is attributable to regrowth in boreal and tropical forests, according to a recent global forest inventory. China and Russia have large areas of forest that are regenerating now that logging has ceased in those (formerly affected) areas. Hard to imagine the mythical 'plant food effect' offsetting continued drying in forest regions. Especially considering tropical forests may in fact be near a heat tolerance threshold, and that a large proportion of global regrowth is occurring in tropical regions. Can you provide references for the studies you refer to? There is at least one study that makes the case that the CO2 fertilization effect on forests is quite real. You can read it at http://www.pnas.org/content/early/2010/02/02/0912376107.abstract) . And there is plenty of data that CO2 enhances plant growth. While there's little chance this enhanced growth will continue to help much in slowing the rise of CO2, it at least offers some hope that if we could significantly slow the dumping of CO2 into the air forest growth might help to eventually stabilize or even reduce CO2 levels, perhaps coupled with wide-scale use of biochar. I discussed this in my blog a while back at http://michaelaucott.blogspot.com/search/label/Climate I agree that drought is a grave worry. Sadly, the tulip tree that I pictured in that blog entry was nearly killed by the severe drought in my area in summer of 2010, and another larger tulip tree did die.